The Falcons and inside linebacker Deion Jones have begun extension talks, according to Vaughn McClure of ESPN.com (on Twitter). Jones still has a year left on his rookie deal, but Atlanta is looking to lock him down ahead of time. Jones is scheduled to make just $1.07MM in 2019 and is due for a serious pay bump. The 2016 second-round pick made an immediate impact as a rookie, registering three interceptions, two pick sixes, and 106 tackles. He followed that up with three more interceptions, 138 tackles, and a sack in 2017, leading to his first Pro Bowl selection. Last year, Jones missed the majority of the season thanks to a broken foot suffered in Week 1, but still managed two INTs, a pick six, 53 tackles, and a sack. Currently, Panthers star Luke Kuechly leads all inside linebackers in compensation at $12.4MM per year. By locking up Jones now, the Falcons can avoid forking over similar cash to the 24-year-old. The Vikings received some excellent news on Monday when an MRI revealed cornerback Xavier Rhodes suffered a “very, very mild” hamstring injury, head coach Mike Zimmer told reporters, including Ben Goessling of the Minneapolis Star Tribune (Twitter link). While Minnesota does have depth in its secondary (Mackensie Alexander, Holton Hill), the club had already lost rookie first-round corner Mike Hughes for the season. And missing Rhodes, who was named All-Pro in 2017, for any amount of time would have been devastating. After beating the Packers on Sunday night, the Vikings now have a 63% chance of earning a postseason berth, per FiveThirtyEight.com. Packers left tackle David Bakhtiari suffered two knee injuries and an ankle injury against the Vikings last night, but there is still hope he’ll be able to play against the Cardinals in Week 13, as Rob Demovsky of ESPN.com writes. After being defeated by Minnesota, Green Bay will almost surely need to win out to have any chance at making the playoffs, and losing Bakhtiari certainly wouldn’t help matters. Arguably the league’s best pass-blocking tackle, Bakhtiari missed six games over his first five seasons in the NFL. If Bakhtiari’s not able to play against Arizona, former second-round pick Jason Spriggs would take over on Aaron Rodgers‘ blindside. After going down with a concussion against the Dolphins, Colts running back Marlon Mack is “iffy” for Week 13, tweets Mike Chappell of Fox59. Mack missed three games with a hamstring injury earlier this year, but has averaged 16.5 carries per game since as Indianapolis’ lead back. The 6-5 Colts face a winnable game against the Jaguars next Sunday as they fight for a playoff spot, and would turn to Jordan Wilkins and Nyheim Hines to play more snaps if Mack can’t go. Buccaneers receiver DeSean Jackson is headed to New York to get a second opinion on his thumb injury, per Jenna Laine of ESPN.com (Twitter link). Jackson was originally injured in Week 11, and while he played against the 49ers in Week 12, it still sounds as though the issue is bothering him. Elsewhere in Tampa Bay, tight end O.J. Howard — who is already on injured reserve — is facing a four-to-six week recovery timeline for his ankle ailment, tweets Laine. Given that the Bucs are already out of postseason contention, Howard isn’t a candidate to return this year. Falcons head coach Dan Quinn said linebacker Deion Jones looks excellent but stopped short of saying Jones will be ready for Week 13, reports Vaughn McClure of ESPN.com (Twitter link). Jones was activated off injured reserve in advance of Week 11, but he still has yet to see the field. After originally suffering a foot injury in Week 1, Jones hasn’t played since, and his — and other key defenders’ — absences have contributed to Atlanta’s disappointing 4-7 record. The Falcons have had awful injury luck this year, but finally got some good news today. Linebacker Deion Jones will be activated off injured reserve, according to Adam Caplan of Sirius XM (Twitter link). The team waived offensive lineman Rees Odhiambo in a corresponding roster move. The news couldn’t come at a better time for the Falcons, as their defense was shredded by Baker Mayfield and the Browns this past week. Jones went down with a foot injury all the way back in Week 1, and hasn’t played since. A 2016 second round pick, Jones had blossomed into one of the best coverage linebackers in the NFL. He was great at covering running backs out of the backfield, and the Falcons have been shredded by opposing backs in the passing game since he went down. In the one game he played this year, Jones had nine tackles, an interception, and two passes defended. Jones is one of a slew of Falcons defensive players who have had extended absences. 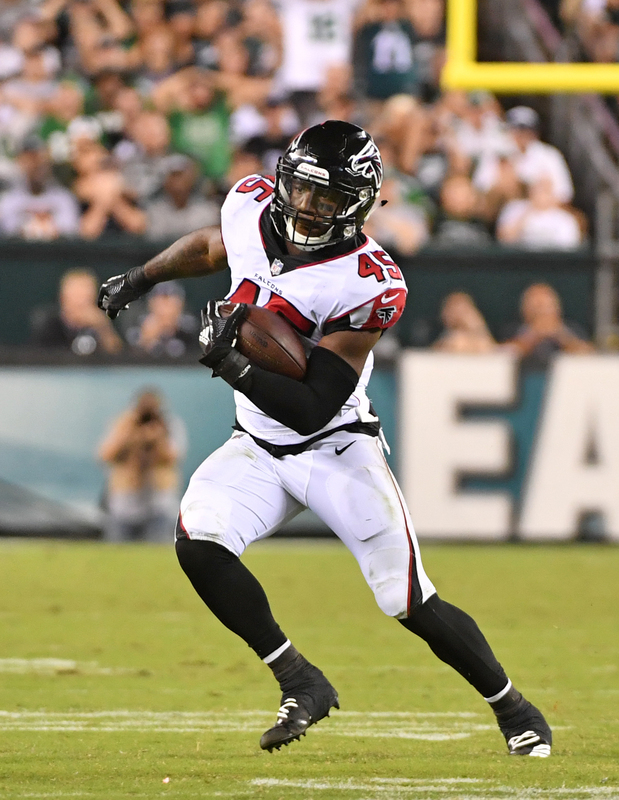 Safety Ricardo Allen is done for the year with a torn achilles, and Keanu Neal was lost for the season with a torn ACL he suffered in Week 1. Atlanta is still a ways away from full health, but this is a massive boost to the defense. Depleted on defense for most of the season, the Falcons stand to soon see one of their top players return to action. Deion Jones participated in practice on Wednesday and has been designated to return from IR, per Pro Football Talk. A broken foot forced the stalwart Atlanta linebacker to IR after Week 1, which turned out to be a brutal game for Falcons injuries. Jones has three weeks to be activated or must spend the rest of the season on IR. He tested his injured foot during a sideline session last week and has progressed back to being able to join teammates at practice. Having missed seven games, Jones would first be eligible to return for the Falcons’ Week can return at any point for the Falcons’ Week 11 contest. Atlanta’s won three straight games, with its defense holding Washington to 14 points. But the weakened unit still ranks 29th in points allowed. Jones, a 2017 Pro Bowler who made 138 stops in his second NFL season, would bring a vital reinforcement to the suddenly back-in-contention team. Deion Jones‘ foot injury is serious enough an IR trip will occur. The Falcons placed their top linebacker on IR Tuesday, meaning he will be out until at least November. The Falcons announced the move but also expect the third-year defender to return this season. However, a corrective procedure will be required for Jones, who joins Keanu Neal as Falcons starting defenders whose Week 1 injuries will result in IR trips. Running back Brian Hill will take Jones’ place on Atlanta’s 53-man roster, with Vaughn McClure of ESPN.com reporting the Falcons will promote the Wyoming product. Devonta Freeman also left the Falcons’ Week 1 game with an injury, but he’s believed to have avoided a serious setback. Jones and Neal were both 2017 Pro Bowlers and critical players to the Falcons’ cause of pushing for a Super Bowl appearance in their home stadium. Neal is out for the year, and Jones will be shelved for at least eight weeks. Pro Football Focus’ No. 1 coverage linebacker last season, Jones intercepted a pass against the Eagles and made nine tackles. He made 138 stops last season. McClure notes outside linebacker Duke Riley could slide into Jones’ middle spot. The Falcons are thin at linebacker, having now only five healthy second-level defenders. They did sign former Broncos backup Corey Nelson, however, likely in preparation for a Jones absence. They may be on the lookout for more help at this spot as well, now that Jones will miss at least the first half of the season. 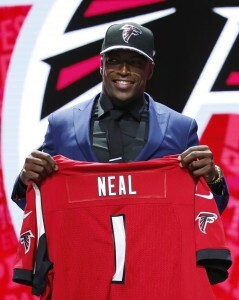 When the Falcons drafted Neal, they did so with the idea that he would start at strong safety from Day 1. That’s exactly how the Falcons are going to use the youngster just as soon as he rebounds from his “trunk” injury that has dogged him in recent weeks. Neal is a smooth, fluid mover who has done quite a nice job of making plays at the opposite side of the field, thanks to his burst, second gear, and ability to sift through traffic to get to the ball. He shows excellent ball reactionary skills, along with the quick decision-making process to close on the play with good urgency. He can change direction in an instant and does a nice job of maintaining position when challenged by lead blockers assisting vs. the ground game. He has the nimble feet you would want in a free safety, along with the loose hips to recover quickly when a receiver gets behind him. He can turn and run with the speediest of receivers, as he is a savvy player who knows how to disrupt the route’s progression by using his hands to knock his coverage assignments off stride. He has the loose hips and sudden burst to close on the ball in a hurry and shows good body control in transition. Neal has excellent hand/eye coordination, along with the leaping ability to get fine elevation going up to get to the pass at its high point (team’s active interception leader). He is quick and fast, which allows him to keep plays in front of him and mirror even the swift flankers and split ends in deep secondary coverage. While he is too valuable as a centerfielder to remove him from either safety position, he has the speed, range and mirroring ability to excel as a slot cornerback, as he is fluid and calm in one-on-one confrontations with split ends and flankers, along with showing the physicality to reroute tight ends and slot backs working in the short areas. Neal has the quickness, agility, and speed needed in the slot to more than handle any NFL No. 3 receiver. His play is reminiscent of Ryan Clark in terms of his ability to quickly locate the receiver and stay on the hip of his man throughout the route. Neal came into this draft with experience at both safety positions, but thanks to the recent success that the Cardinals and Rams had in utilizing big safeties to play the Cover-2 linebacker role, Neal drew extra attention. Handling Cover-2 assignments at the next level will see Neal return to his roots as he was a second level defender during his days at South Sumter High School. Continue reading about the Falcons’ rookies.. 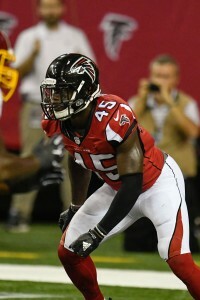 The Falcons have missed the steady play of Curtis Lofton, having let the middle linebacker leave after the 2011 season. Paul Worrilow manned the position last year, leading the team with 95 tackles, but the slow-footed defender struggled to contain the running game, evident by the twenty touchdowns Atlanta allowed vs. the run last season. While there were much bigger options in the draft, Atlanta recognized that Jones’ instincts and quickness far outweigh his deficiencies – size and bulk. Still, the Butkus Award finalist joins the team having only started for the Tigers last season. He did make the most of his one year with the first unit, leading LSU in tackles with 100. Previously, he had thrived on special teams for first three years before flourishing as a senior at outside linebacker. He capped his career with 165 tackles, 21.0 stops-for-loss, and five sacks while playing in 51 games with 12 starts. He would serve as team captain and shared the squad MVP honors. What separates Jones from most in his draft class is his outstanding instincts and reaction speed, as he knows the game and plays very fast. He is the type that reads plays quickly, whether smelling out a screen or coming off an edge blitz to take away an open back coming into the flat. There are times where he can get a bit overzealous against the run and will bite on play-action, but he has that burst needed to recover. Because of his range, Jones can cover more ground than most linebackers, as he displays good lateral quickness and generally takes solid angles. He is also the type that can generate straight-line speed and closing burst to make impact plays in the backfield (13.5 tackles-for-loss in 2015). He does a nice job of breaking down in the open field and will consistently wrap up and get his man down. His only real knock here is that he does not display explosive initial pop as a hitter, which is partially a byproduct of his lack of elite size and bulk. The Falcons have now signed their entire draft class, as Vaughn McClure of ESPN.com writes. Strong safety Keanu Neal (whose signing was completed days ago), linebacker Deion Jones (second round), tight end Austin Hooper (third round), linebacker De’Vondre Campbell (fourth round), guard Wes Schweitzer (sixth round), and wide receiver Devin Fuller (seventh round) have all put pen to paper. Jones, an LSU product, finished out his college career in style with 88 total tackles, 12.5 tackles for a loss, two interceptions, one forced fumble, and three passes defensed. Jones started only one game through his first three years in Baton Rouge, but he exploded when given the opportunity in his senior season. Jones impressed scouts with a 4.38 second 40-yard-dash at his Pro Day and despite concerns about being undersized, he drew interest from a host of teams looking for a tough linebacker. In other Falcons news, linebacker O’Brien Schofield is lobbying hard for a reunion. Meanwhile, free agent cornerback Leon Hall remains on the open market after his visit with Atlanta. Myles Jack told SiriusXM NFL Radio (Twitter link) that he has only worked out for the Dolphins and Saints so far. The UCLA linebacker, widely considered to be one of the top talents in the 2016 draft, is pegged to go No. 2 overall to the Browns in PFR’s (v. 1.0) mock draft. The Saints (No. 12 overall) and the Dolphins (No. 13 overall) may have to move up in the draft order if they want to land the athletic prospect. 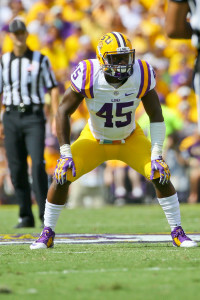 LSU linebacker Deion Jones has already visited the Saints, Ravens, and Jets, according to Rand Getlin of NFL.com (on Twitter). Jones is now set to visit the Eagles and Colts this week. He also had solo workouts with the 49ers, Dolphins, Titans, Lions, Falcons, and Panthers (link). Louisiana Tech defensive tackle Vernon Butler visited the Seahawks on Monday, according to Ian Rapoport of NFL.com (on Twitter). After that, he has the Lions on Tuesday, the Buccaneers on Wednesday, and the Bills on Thursday. Utah running back Devontae Booker will visit with the Dolphins on Tuesday and also with the Patriots later in the week, Rapoport tweets. Baylor wide receiver Jay Lee has visits lined up with the Ravens, Browns, and Seahawks plus private workouts for the Patriots, Cowboys, Lions, Seahawks, and Jaguars, Aaron Wilson of The Houston Chronicle tweets. San Diego State offensive tackle Darrell Greene visited the Vikings and Chargers and he’ll have private workouts with the Texans, Browns, Eagles, Colts, and 49ers, Wilson tweets. While Jackson seems unlikely to face severe legal penalties, no matter how the case is resolved, the NFL could eventually hand down discipline of its own for the incident. Word in league circles is that the Titans are still shopping the first overall pick, exploring trade options, a league source tells Terry McCormick of TitanInsider.com (Twitter link). If Tennessee does make a deal involving its No. 1 pick, it’s unlikely to be consummated until much closer to draft day. Former agent Joel Corry takes a deep dive into the Drew Brees contract situation in a piece for CBSSports.com, explaining how the Saints could create $10MM in 2016 cap room by signing their star quarterback to an extension through the 2020 season. Albama running back Derrick Henry and Clemson defensive end Kevin Dodd are among the draft prospects set to visit the Panthers, per multiple reports (Twitter links via Tom Pelissero of USA Today and Joseph Person of the Charlotte Observer). David Newton of ESPN.com explores Henry’s potential fit in Carolina. The Falcons, who are looking to improve their team speed at the linebacker position, have a private workout scheduled with LSU’s Deion Jones on Thursday, as Vaughn McClure of ESPN.com details.